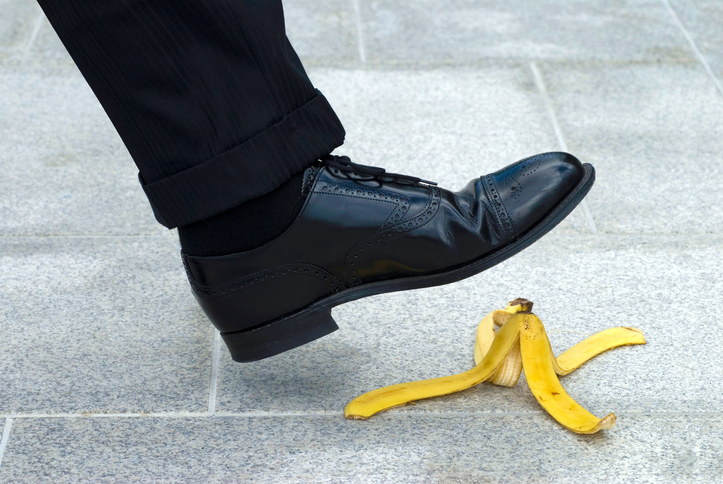 Be careful not to slip on that banana skin! To slip means ‘to move smoothly,’ ‘to move quietly without being noticed,’ and also ‘to slide accidentally and fall or almost fall.’ Figuratively, it can mean ‘to fall below standard’ or ‘to become involved in or start doing something.’ If you make a mistake that is also to slip, usually followed by up, and, when we are talking about words, it also means ‘to be said unintentionally,’ usually followed by out. It can also mean ‘to be lost or get away.’ As a noun, a slip is a sudden slide, a small mistake, or a decline or fall in quantity or quality. Unrelatedly, a slip is also a small piece of paper and, informally, a young and thin person. The ice cream slipped off the scoop. The meeting had already started when George slipped into the room. Fiona's parents are worried because her grades have slipped. Malcolm has slipped into old habits and has started smoking again. The suspect slipped up when she told the police she hadn't left her house all night; they had CCTV footage of her near the victim's house. Alison didn't mean to tell Luke about the surprise party; it just slipped out. A slip on some ice left Steve with a broken leg. Please complete the tear-off slip at the bottom of this letter and return it to us. A slip is also a woman’s undergarment—either a sleeveless garment with straps extending from the bust down to the hemline or an underskirt. Slip dates back to the late 13th century. The Middle English verb slippen originally meant ‘to escape’ or ‘to move softly and quickly.’ It may have come from an Old English verb that was lost, or from the Middle Dutch or Middle Low German verb slippen (to glide or slide). It can be traced back to the Proto-Germanic verb slipan, and the Proto-Indo-European root (s)lei- (slimy, sticky or slippery). It is related to the German schleifen (to slide or glide), as well as the English words slide and slime. The senses ‘lose your footing,’ ‘slide out of place’ and ‘fall into error’ all date back to the mid-14th century, while ‘to pass unguarded or unseen’ first appeared in the mid-15th century, and ‘to slide or glide’ is from the early 16th century. It has been used transitively (to slip something) since the early 16th century, and the sense ‘to insert secretly’ is from the late 17th century. To slip up (make a mistake) is from the mid-19th century, while to slip through the net was first used around the year 1900. The noun, meaning ‘act of slipping,’ comes from the verb, and dates back to the late 16th century. The sense ‘a mistake or blunder’ is from the early 17th century. Other senses of the noun closely follow the appearance of verbal senses. Meanwhile, slip, meaning a woman’s undergarment, is unrelated. It dates back to the mid-15th century. The Middle English slippe, originally meaning ‘the edge of a garment’ or ‘a narrow strip of cloth,’ probably comes from the Middle Dutch or Middle Low German slippe (cut or slit), but may also have evolved from the Old English verb toslifan (to slit or cleave). The meaning ‘a narrow piece of paper’ appeared in the late 17th century. Another noun meaning, ‘a sprig or twig’ of a plant, is of uncertain origin, though probably related. It dates back to the late 15th century. The sense of a young and thin person is a figurative use of this sense, and appeared in the mid-17th century.